Dave & Buster’s is the new mix of FUN. Eat the latest chef-crafted dishes. Drink with friends at one of our bars. Play the hottest interactive games. Watch your favorite teams on game day. You can have it all under one roof. National Gift Card is the best place for you to order Dave and Busters gift cards in bulk. We are the experts in all things gift cards and can set up your gift card solutions program for you today. Please contact us for more information on Dave and Busters bulk, direct-to-recipient, or individual gift card fulfillment for your gift card program. Contact us here or call us at 888-472-8747 today! 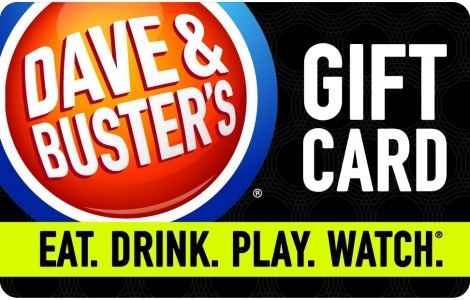 Use of this gift card (“Card”) constitutes acceptance of the following terms and conditions: This Card may only be redeemed for the purchase of food, beverages, game play, merchandise, taxes and gratuities, but not special events or private parties at any Dave & Buster’s in the United States. This Card will not be redeemed for cash except as may be required by law. This is not a credit/debit Card and has no implied warranties. If the Card is lost, stolen or damaged, it will not be honored or replaced except as may be required by law. House policies vary by location – please check www.daveandbusters.com/locations for details. This Card is issued by D&B Marketing Company, LLC a Virginia limited liability company. © 2016 All rights reserved. For Card balance information, call 1-888-386-5230 or visit daveandbusters.com/giftcards.